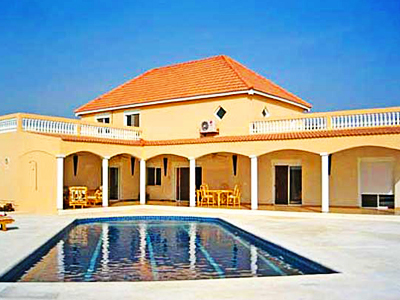 The villa is located at about 200m from a shopping area, at 250m from the beach, at 5km from the city center and at 90km from Dakar airport. *Capacity : up to 4 persons. *Description : 2 bedrooms, 1 bathroom, 2 toilets, little kitchen, living room, terrace, garden, shared parking , shared swimming-pool. East oriented. Garden of 40 m2. * Dishes and cutlery, stove, iron, microwave oven, fridge and freezer, washing machine. * sheets provided, housekeeper, towels, laundry renting and 2 keys of the villa provided on arrival. • Deposit: 25% of the rent on booking. * Due on arrival and returned on departure after inventory, state of repair and payment of service charges. 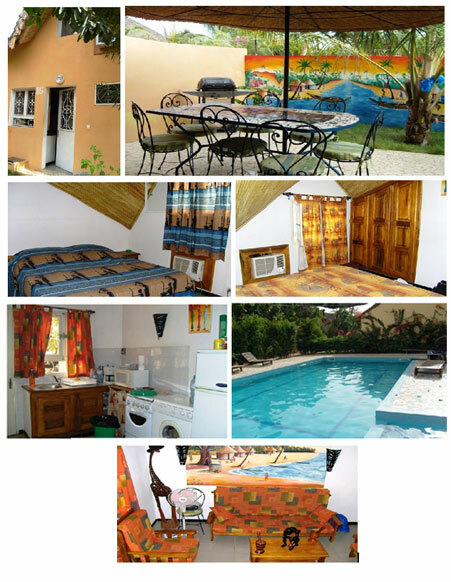 • Rates: water, electricity (around 35 euros/week) according to use and air-conditionning. • Bed tax : 0.91euros per day and per person. • Transports : round-trip up to 4 persons.